South Korea's customs authorities said Tuesday they have arrested or indicted seven men for smuggling in cigarettes worth 6.4 billion won ($5.8 million). Four suspects allegedly imported some 800,000 packs of Korean-made cigarettes worth 3.5 billion won from the Philippines through Busan seaport and reported them as wooden chairs after stealing them from a bonded warehouse between November 2014 and March 2016, according to the Korea Customs Service. Three were accused of smuggling 500,000 packages of British tobacco from the United Arab Emirates into South Korea by disguising them as plastic toolboxes and then exporting them to a third country. One suspect allegedly smuggled 40,000 packs of South Korean cigarettes. The customs agency said it has intensified the crackdown on cigarette smuggling, which has been on a rise for months since a price hike in January last year. 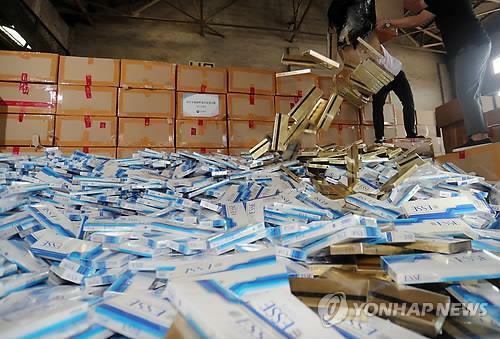 The agency has caught 239 cases of smuggling through June this year, involving 6.7 billion won worth of cigarettes.